As 2013 was beginning, financial institutions were cautiously celebrating what seemed to be signs of recovery from a bruising five-year recession. Georgia’s credit union executives were publishing numbers they believe to be the clearest signs of sound financial footing since the dot-com, real estate and banking crises of the distant past. “We have really weathered the storms well,” says Doug Foote, president and CEO of Georgia United Credit Union (GUCU) in Duluth, an Atlanta suburb. “It wasn’t easy to do, but we’ve come out the other end and still are as financially strong as we were going into it.” As proof of the credit union’s resiliency, Georgia United’s member newsletter cited an increase in its new vehicle loans of 15.4 percent from 2011 to 2012, with an increase of 7.9 percent in used vehicle loans during the same period. But those numbers could be just footnotes to a larger story. “In the past 10 years, we’ve quadrupled in size,” Foote says. “When I started 10 years ago, we were right at $250 million [in assets]. Now we’re at $940 million and knocking on $1 billion.” He points out that about half that period fell during a time when Atlanta and its suburbs were struggling through a housing collapse and the nation was in a recession. Georgia United wasn’t the only credit union to record growth during the past decade. There is another way credit unions can grow, and it has less to do with the economy and almost everything to do with the metamorphic character of these financial institutions. Doug Foote’s Georgia United Credit Union may be one of the best at shedding its past role and growing into something else, each time becoming something that adds new members by the carloads. Credit unions became part of the American financial landscape in 1934 when the Federal Credit Union Act was signed into law by President Roosevelt as part of his New Deal, a series of programs aimed at getting the country out of the Great Depression. The act, it was believed, would “make more credit available and promote thrift through a national system of nonprofit, cooperative credit,” according to the website of the National Credit Union Administration, the modern regulatory agency of credit unions. The idea of a group of workers with a common occupation coming together to start their own credit union has evolved into something far different some 80 years later. No credit union better exemplifies the changing nature of the institution’s membership than Georgia United. Today there are 500 different businesses, associations, organizations, government groups and religious organizations whose members do their banking at GUCU’s offices, with many employers calling the memberships a company benefit. To gain even more latitude in the addition of new members, GUCU recently moved from a federally chartered institution to a state chartered one. “We can pick up whole counties to serve with a state charter,” says Foote, president and CEO of GUCU, whose credit union membership was primarily DeKalb County teachers in 1958 when the institution was formed – it celebrated its 55th anniversary April 8. “That membership has been diluted, and we have become a melting pot through those groups we’ve taken in,” he says. “We have a lot of folks coming through our affiliation with the University of Georgia (UGA) and the whole Archdiocese of Atlanta and the Catholic Church – I’ve got a monsignor on my board.” In addition, GUCU’s widely varied members include entities from Abatement Technologies, Inc. to Zaxby’s Franchising, Inc.
Credit unions have 95 million members nationwide, giving them a strong voice on matters debated in Washington, which is where about 4,000 of those members gathered this year as winter was melting into spring for the annual meeting of the Credit Union National Association, chaired by Georgia Credit Union Affiliates’ Mercer. The mission of some 100 executives from Georgia’s 140 credit unions was to loosen restraints on future growth, Mercer says. Mercer says half of the 7,000-plus credit unions in the U.S. have five employees or less. “You can just imagine the impact 120 changes from 15 agencies has on a small financial organization,” he says. The credit unions went to Washington to also ask for changes in the Consumer Financial Protection Bureau (CFPB), a federal regulatory agency Mercer says is burdening credit unions and small banks with unnecessary regulations. “Some of the credit unions have decided to just throw in the towel,” Mercer says. “They just can’t do it any more.” Among the credit union recommendations to the legislators: congressional oversight of the CFPB, simplification of the examination process and appointment of an ombudsman to whom credit unions could appeal during or following an exam. Mercer was speaking during the time when reports came from online financial service Go Banking Rates that a survey of 4,000 U.S. banks and credit unions showed interest rates on savings and CD accounts in Georgia were dropping from 2011-2012 levels as the year began, a function of consumer banking habits in an climate where uncertainty rules, says Mercer. In addition to creating sudden rises in the number of customers, there is another reason credit unions covet diversity in their memberships: It can be a hedge against sudden economic disasters, such as plant closings or layoffs. “We’ve done a good job of diversifying our field of membership in case there was a negative impact on any one of the trade organizations or associations or employers responsible for our members,” says Jerry Johnson, president/CEO of Georgia Power Valdosta Federal Credit Union, whose membership and service area goes far beyond what the name implies. “We are a multiple-employee group, occupationally bonded credit union, which means membership eligibility is through employment with one of those employee groups in our membership field.” There are 66 of those employee groups, ranging from, naturally, Georgia Power to employees of several municipalities, the local chamber of commerce, manufacturers, insurance agents and auto dealers. These days, Janet Davis is keeping track of all the news out of Washington concerning the progress of the Defense Base Closure & Realignment Commis-sion (BRAC) activities, a government body responsible for deciding which military installations in the U.S. will grow, close or be remodeled for a new mission. The decisions can affect hundreds of thousands of jobs across the country. This year, in an atmosphere of the BRAC study, the struggle over budget cuts across the board and an earlier announcement that 800,000 DOD em-ployees will be furloughed, Davis has been making out-of-the-ordinary contingency plans she hopes she will not have to use. The plan centers on a few questions: What do we do if some of our Fort Benning credit union member employees lose their jobs or if businesses dependent on the Army post have layoffs due to downgrades by BRAC? “Instead of just looking at [credit] scores, we’re looking at the individual as a person,” Davis says. “A lot of times, lending stops at that score. You do have a lot of people who [may] have had a bad situation in their life, but maybe it’s just a one-time thing. You do have people whose scores have dropped, and we’ve seen families suffering because of job losses in this economy.” A possible rehearsal for what could lie ahead, she says. Such loans would be designed to help members in good standing over the tough times caused by a job loss, Davis says. “That doesn’t mean loan forgiveness. In some cases, we could set up interest-only payment plans or extend the life of the loans,” says Davis. And if the unthinkable happens and Fort Benning suffers a reduction in force from any source, TIC Credit Union members will be afforded the opportunity to set up special payment plans or debt restructuring, according to Davis. It’s all part of helping customers weather those economic storms. 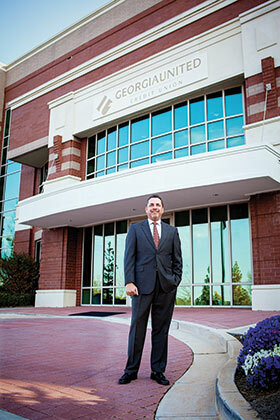 Clark Howard may be the best-known credit union member in Georgia. In fact, the consumer affairs expert is a member of two credit unions. “I joined my first credit union in 1975 when I was 19,” says Howard, a syndicated columnist, author of nine consumer advice books and a host of television and radio consumer reports and call-in programs. “What I’ve learned in the 38 years I’ve been a credit union member is that credit unions had a near-death experience back in the ‘90s when the banks won a Supreme Court case that was going to destroy credit unions,” recalls the Atlanta native. Howard is clearly a fan of credit unions and has expressed himself on the subject in his role as a consumer affairs expert whose opinions are carried in national news programs, as well as his syndicated works. He believes the future of credit unions is bright, thanks to the spread of technology in the modern financial world. “That’s the leveler for them, the thing that really helps, because most credit unions are smaller than banks, but most all banking now is electronic. It’s the great equalizer,” he says.